Hotel Novotel Freiburg am Konzerthaus. Book now! Free Wifi! At the 4-star Novotel Freiburg am Konzerthaus hotel, make the most of its close proximity to the main train station and city center. Shops, theaters and the attractions of the historic old town are within walking distance. Combine work and relaxation in our comfortable rooms with free WiFi and relax in our spa area. You'll love our restaurant with terrace and varied cuisine, and our modern bar is the perfect place to round off your day. Two children can stay in family rooms for free at Novotel. MyRoom by Lisa & Katja: music on, world off! La Rotonde is open from 6.30am for our buffet breakfast. We serve both dishes from around the world and regional specialties in modern surroundings. The restaurant also has a pretty outdoor terrace. The "Scotch Corner" bar is the perfect place to unwind with a revitalizing drink after a hard day. Open daily from 6pm to 1am, the bar accommodates up to 40 people. Worry and hassle free. Friendly and helpful staff. Don’t understand why I was asked for a €700 deposit for a 3 night stay. I have stayed here before and have never been asked for a deposit. I found it insulting. Room with a very nice view Very friendly & helpfull staff Unfortunately booked a room for 3 people, only 2 bathtowels and the additional bed was not made upon arrival in the evening. Everything in the hotel was fine- my score would have been and 8 or 9. However, it turns out I was bitten by bed bugs during my stay which is the reason for my poor rating- I only discovered this after returning home. Not a secure place - a colleague guest wa robbed in his room. Below average - in addition to the incident above; no laundry forms and bags are replaced daily at the room; laundry service - quality is poor. I left my cologne (Omega Cologne at the room 519 - expect you to return it to me via mail ASAP). Stayed for 3 nights, and had an excellent breakfast. The evening restaurant only had a few things to choose from. Cleaning in the room wasn't so good, they forgot to remove used glasses and to bring new towels. The staff were friendly and welcoming -- I arrived about 15 minutes before 3pm and my room wasn't quite ready. I sat in the lobby and was going to go over to the desk at 3:05 to see if I could get my roomkey. But, to my pleasant surprise, the receptionist came over less than 10 minutes later with my roomkey. The room itself was comfortable (with a great view!) and the breakfast was good. Good hospitality, good room surfaces,good food as quality including different flavors,cooperative Receptionest. 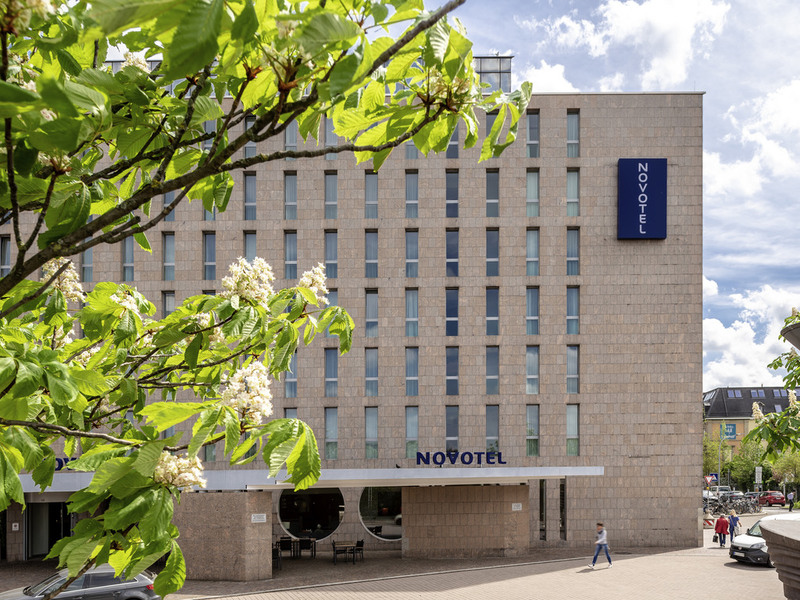 I usually stay in the Novotel during a stay in Freiburg, staff are friendly. Rooms spacious and quiet. The hotel is located in a perfect location close to the center and to the train station. The structure is very nice and the restaurant serves good quality food. The rooms were very nice and comfortable. I was disappointed with the payment method, I did not know that €400 would be taken out of my account for my stay. It would have been best if I was notified apon arrival so I was not shocked when I looked in my bank account. I was also disappointed that it took up three days after my stay to transfer back into my bank account. Good hotel, nice placement in city, boring breakfast. Nice rooms, but seemingly worn rooms. Good restaurant, with a nice menu but not a lot to choose from. All meals I have tried from there was very well made, and arranged beautifully Breakfast is not very interesting, and without variation. But most hotels are this way. Staff is friendly. Hotel is very nice and comfortable. Close location to the old city.